Sometimes a sandwich can taste great and still be frustrating. 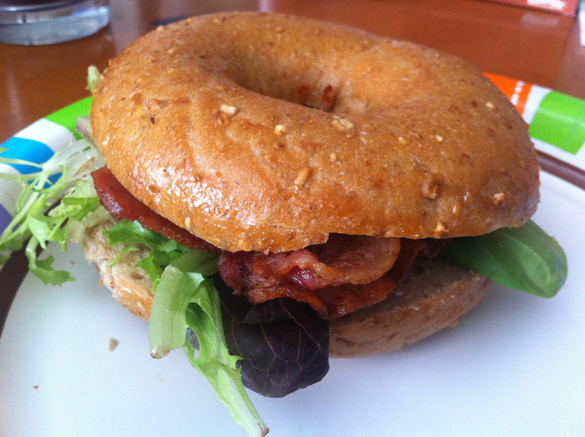 This is what I encountered during my latest foray into the wonder of bagel sandwiches. The slight toasting of the bagel had fried the cheese on all sides of the bagel to a crisp. Eat bite and each squeeze sent shards of cheese and bagel flying everywhere. It was a messy and annoying enterprise. Although the sandwich was tasty and satisfying, I was left strangely morose by the experience. 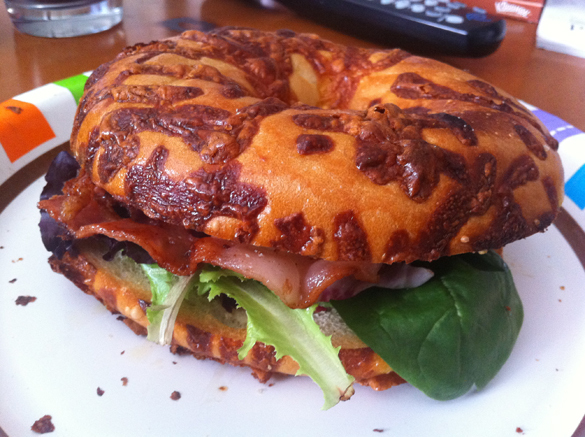 I repeated the same ingredients on an untoasted wheat bagel a short time later. This second sandwich, although very nearly identical in all ways to the first, was endlessly more enjoyable. Sometimes the full enjoyment of a sandwich is a very precarious thing. Everything can be in place, everything can taste great, but one tiny little thing can ruin your sandwich experience. What a delicate life we lead. This entry was posted in General Sandwich Discussion, Sandwich Reviews and tagged Reviews by Bill, Sandwiches I Have Eaten, Sandwiches I Have Made by bengrimm. Bookmark the permalink.